Contribution to sustainability: New management approaches are to be developed to reduce land consumption, with the aid of which environmental protection and nature conservation can be harmonized with both economic growth and also socially compatible housing, quality of urban building and mobility. Action orientation: REFINA projects also include the examination and implementation of the approaches and strategies developed in demonstration projects. They are action-oriented since it is planned to implement the results directly on site.
" Inter- and transdisciplinarity: Successful project implementation is only possible if a large number of different disciplines work together. 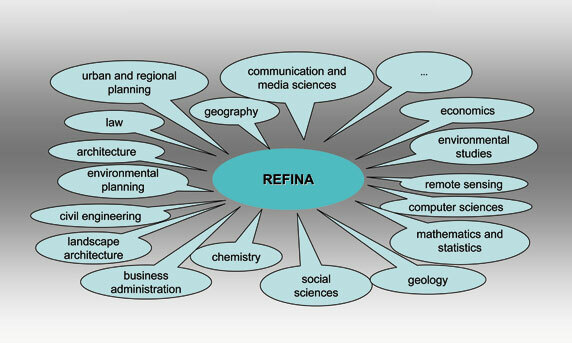 REFINA therefore encourages a concentration and creation of transdisciplinary networks of expertise. Transferability: The results of the REFINA projects are to be documented as an example so that they can be transferred to other areas with similar economic, ecological and social "boundary conditions". Actor cooperation: One characteristic feature of REFINA is the interdisciplinary cooperation between scientific institutions, local authorities and commercial enterprises in collaborative projects. Scientific treatment of the issues is therefore closely related to practical applications.